Regardless of why they would want to cross the road, doing so is dangerous for turtles, especially since a certain percentage of the population will try to run them over. However, snapping turtles are dangerous enough that I am certainly not going to try and pick one up, so how would I help one get to the other side of the road without hurting it? Several years ago, I helped two men move a large turtle about 1,000 feet to a stream. They had been driving by and saw the turtle on the road, and saw me in my driveway. I don't know if this was a snapping turtle or not, but no one wanted to find out first hand. I've actually driven up to a very large (more than 1 foot across) snapping turtle. While it may not be the answer you want, you simply don't. Things I've tried: This is based on actual experience. Lift them from behind: While easy to run around behind them, it doesn't work. Little known fact, they can "leap" very small distances, easily out of your hands. Lift them by the tail: Risk of spinal injury for the turtle, and dangerous for you unless you have rather long arms. Flip them over: No good. I tried prying with a 3" diameter branch... can't do it. They have very strong legs and it's really hard to flip them. I gave up when it snapped and broke the 3" diameter branch in half. Noting that my tibia is less than 3" diameter I decided to leave nature to its thing. The best you can hope for is to block the road until they finish their journey. Unfortunately they are likely to just chill and not move while you are close by. As Sue reiterates in her comment, the most likely outcome of trying to help a snapping turtle is that you injure/maim the turtle. Close after that is the likelihood that you suffer serious injury as snapping turtles can easily remove parts of your body. 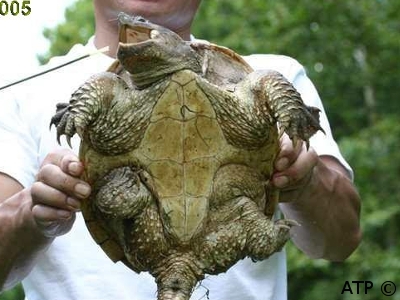 Snapping turtles should never be picked up by their tails as this can damage the animal's vertebral column and tail, not to mention the human who is in danger of being bitten. Because snapping turtles can be slimy and heavy, the Wildlife Division does not recommend that anyone manually pick them up. I know this question has been protected, but since I was invited in a comment to post an answer, especially about things that we shouldn't do, I'm going to add this. There is some great, as well as some very dangerous, advice in the existing answers and comments. Although this answer will have some redundancy with those, I'm not trying to take credit away or represent anyone else's advice or research as my own. Also, any criticism isn't personal, but based on advice from experts and research I trust. If this is unwanted, or doesn't contribute anything of value, let me know and I'll delete it! Also, obviously nobody's perfect, and there are many times people safely help turtles cross using less than ideal methods. Some of those are included in the sources I've referenced. It's never better to just leave it there to get run over!! However, especially now that I've done so much reading on the subject, my advice will err on the side of caution! I volunteer for the Massachusetts Audubon Society, and have had lengthy discussions with their herpetologist (reptile specialist). I also spoke with the experts at Tufts Wildlife Center, a world-renowned research, rescue and rehabilitation center, the Turtle Rescue League, the snapping turtle department at the Tortoise Trust, and the Massachusetts State Herpetologist. Also, for years we had a pet Northeast Painted turtle which my husband rescued as a hatchling, so I consulted with the herpetologist who cared for him. I've also read numerous online sources. Along with the good, a lot of information out there is either wrong, misleading, or only meant for professionals, so I've been admonished to read sources very carefully. Why is the large snapper in the road? Sometimes the large snapper in the road is a male who's helping find a nesting site, but most frequently it's a mother who's either going to, or from, that nesting site. It happens primarily twice a year, in the spring and the fall. She lives and breeds in the water in a swampy area, but lays the eggs in sandy soil quite a distance away, sometimes as far as 10 miles (16km). It's not her fault that humans have built roads in between! Once the eggs are laid, the mother travels back and forth many times, along the exact same route, during the lengthy incubation period (as long as 80-90 days). Turtles in the road are on a mission, and sometimes carrying eggs, so protecting them is vital. Obviously, safety is important to you, which is why you asked the question! As for basking, my sources say it's unusual. Unlike some other turtles, snappers prefer to bask with most of the body under water, and always in an area where they feel safe. Dry hot sun above, hot pavement below, and noise all around make street-basking less comfortable. Keep it protected, safe, and try not to touch it. The snapper is the one turtle that lay-people should never attempt to pick up. Walk behind or even straddle it. That will cause it to move, or keep it moving. Since snappers almost always walk in a straight line, you don't have to worry about them darting around like other animals, and finishing the crossing doesn't take that long. Snappers are shy in general, and don't chase people. Aggression is a defense mechanism. Make sure it ends up in the direction it was going. This is mandatory! Never turn it sideways, or around so it's facing the road. If it gets turned around, it will get confused enough to go back into the road, which defeats the purpose! To make sure it's headed in the right direction, watch it walk all the way off the road. Always keep it on the path it chose. Don't ever send or lead the turtle to an area away from where you found it, even if it looks to you like a "better place." The same breeding spots are used for years in a row (it's called "nest site fidelity") and the turtle knows where it is. Also, the turtle has a "home range" and if it gets lost, it may stop eating and just wander listlessly. Straying out of the home range also increases the risk of spreading diseases to other wild turtles. Why shouldn't I lift it? A snapper is built a bit differently than some other turtles, and is more fragile than it looks. Some basic facts about anatomy can help us understand why certain methods should be chosen or avoided. The picture on the left (source) is a common snapper. The one on the right (source) is a common yellow-bellied slider. Also, an excellent illustration of a snapper top and bottom can be found here. 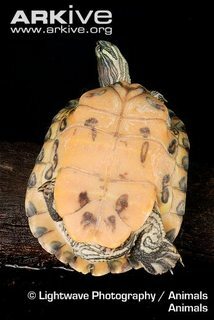 The top shell is the carapace, and the bottom shell, also called the underbelly, is the plastron. They're both part of the spine, and are bones. They're joined together on the sides of the midsection. That junction is not as wide as most other turtles. As you can see, the snapper has a smaller and softer plastron than some other breeds, leaving the belly and internal organs more vulnerable. It's also covered with something called papillae, which help increase oxygen uptake. Those need protecion. The shell breaks easily when lifted, bent, or when significant pressure is applied either from above or below. If that happens, it almost always breaks other sections of the body along with it, and the turtle dies. The tail is almost the length of the body, and is fused to the spine the entire way. The tail is a powerful weapon and can thrash sideways almost the full length of the body on either side. The neck is almost the length of the body, and can reach the whole way around, with the exception of where the tail is attached, and high enough to protect the whole top of the shell. There is no safe place for your hands. What if I really have or want to move it? What shouldn't I do? Never "use" the tail. Don't lift, drag or raise it by the tail, not even just a few inches. Doing so will almost always break the back, damage internal organs, or both. You may not know it at the time, but even if it gets to the other side, it's already in pain and will likely become paralyzed. If it doesn't die, it will be weakened and more vulnerable to prey. If it's a female, she'll also be unable to complete the cycle of caring for her babies, and if she's carrying eggs, they'll die. Never lift it by any part of the top of the shell. Remember that the whole body is connected to it, and even the largest and strongest snappers are likely to break in half. Even a sectional or edge-only break puts the whole life in danger. Never lift at the junction of the carapace and the plastron. This is okay with other turtles but not the snapper. It can hurt the back and belly. Plus, a full grown snapper can, and will if it's agitated, reach its head around and take off your hands! Never lift it more than a few inches off the ground. It makes it nervous. No matter what method you use, don't put it in a position where it may thrash around and fall. As we know, if humans are holding something that starts wiggling and thrashing, our instinct is to drop it. Keeping the turtle close to the ground can prevent that. Never pull it using something in the mouth. It's bad for the neck and back, and dangerous for the person doing the pulling. In a tug-of-war with a snapper, the turtle always wins! In the process it gets injured, or injures you. If you're too close, it may drop it and grab your arm instead. Never drag/push it by the belly. As I said, it has exposed organs, a soft carapace, and is extremely delicate. There are times that relocation involves some contact with the underbelly, but keeping that to a minimum is best for the turtle, and gentleness is essential. Try to stay away from the front end. Putting something like a stick in its mouth, even without dragging, can backfire. However, laying a smooth-edged stick (or handle of a broom or shovel) sideways on the ground in front can give it something to lunge for and grab onto if you're bothering it in back. Sometimes a relocation method requires some attention to the front, but keep as much of a distance as possible, and move away quickly. When it snaps, it's fast and hard! Don't lift/pull it by the legs. Never pull on the front legs. You can gently sneak under the back legs to use one of the relocation methods, but avoid pulling. Don't pick up the back end and push it, wheelbarrow-style, using the front legs to walk across the road. If you've seen that online, ignore it. Don't "shove" it from behind. Don't scoop it onto something like a shovel unless it's level and large enough to hold the entire body. Keep the turtle from being bent. Never scoop it onto something and shove, throw or toss it. Never flip it over. It's susceptible to injury, and once you've exposed the neck and those huge legs, so are you! If it's a female with eggs, you'll put them in jeopardy. Never ever turn it upside down and lie it along your arm. If you've seen pictures of that, ignore them. The animal is always a smaller size or not a true snapper. It's also frequently drugged, or with a professional who knows it well enough to let it relax there for a minute. What can I safely do? Using the guidelines above, there are a few safe ways to help it get to the other side. If you're alone, the best advice is to give the turtle a bit of a nudge. Stay behind it, and always use something blunt, like the front of your shoe, or a soft stick. Shoving or poking can injure or anger her, so do it gently and try to stay on either side of the tail. In general, don't use something wide, like a broom, as it's hard to control. Although most people don't, if you have a large enough cardboard box you can trap the turtle. This method is safe for both of you. (Turtle Traps exist, but are used mostly by people who have snappers in their yard.) If it won't walk, use the nudge method to encourage it to go in. Slide the box across the road and gently get the turtle out. Remember again to make sure it's facing the correct way when you release it. You can take a floor mat out of your car, slide it underneath the turtle and move it gently, being careful not to scrape. My herpetologists say that's effective and generally safe for the turtle, if you can get the mat underneath. Starting from the back, inch it gently under until at least most of the body is on. Then turn the mat around and drag by the back end of the mat until you get to the other side. (Don't lift.) Immediately turn it back around so the turtle's facing the correct way, and gently inch it off the mat. In an emergency or you really have no other choice, you can put your hands under the carapace (not the body) at the back end, one on each side of the tail, and lift it. Only raise it a little bit, and tilt it up at enough of an angle so it doesn't fall forward. Very quickly get it to a safe place and gently set it down. What should we do when it's safe on the other side and headed in the right direction? Wish it a happy and safe day! Be glad that you saved the life of this and future generations of turtles. Thank anyone who helped you or stopped traffic while you helped the turtle. Breathe a sigh of relief that you didn't get hurt! Where can I learn more about snapping turtles and relocation? There are lots of sources for good information. Read carefully and if you see or read something that goes against what most of them are saying, don't do it! Tortoise Trust has some excellent pages dedicated to snapping turtles. Chelydra.org also has many different pages dedicated to the snapping turtle, including this. The best way would be to get a thick stick of suitable length and let the snapper bite it. He likely will be stubborn enough to hang on while you drag him where you want him to go. When he is there, drop the stick and let him go on his way while you go yours. 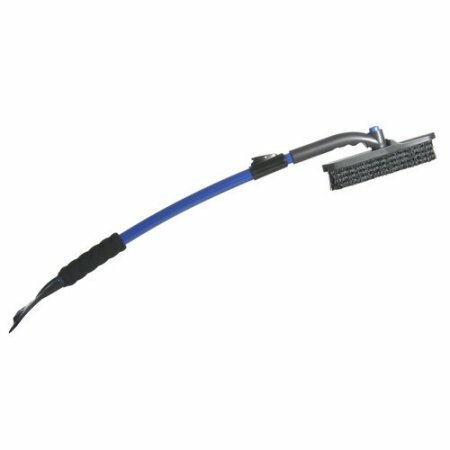 Even though I have a relatively small car, I keep long handled snow brush like the one pictured below in my car all year round. The brush end can twist to make it more like a push broom. I've shooed snakes, turtles and geese out of the road with it. Turtles snapped it, snakes bit and, and geese honked at it, but it's still standing. The brush handle is about 4.5 ft long fully extended, so I've got a good distance on the critters. Disclaimer : Don't stop to save animals, and if you do and get hit, it's your choice to do so, not mine, blah blah blah yadda yadda please don't sue me. I've done this once with a medium sized turtle - it was probably about 18+ inches in diameter, and I guess 40 or so pounds. I took a sweatshirt from the trunk, threw it over the turtle's rear end, and lifted - it was too heavy and awkward for me to fully lift, but I got it about an inch of the ground. The turtle hissed and was cranky, but it was startled enough to get moving. The lift, plus the general annoyance of the turtle was enough to get it moving towards the side of the road. As soon as it was on the shoulder I let go, grabbed my sweatshirt and backed away, and it went of into the woods. The only problem I had was I think it peed on my shirt, but a wash fixed that. If you do this - keep an eye out for their mouth - snappers can have very, very long necks and powerful jaws. BTW: You should always move a turtle in the direction its already facing, never move it where you 'think' it should go. Contrary to some other answers here, you should be able to just pick it up from behind by the shell, though you need some considerable strength to do so for larger turtles. To see this being done many many times without injury to the turtles you can view the videos of Coyote Peterson available on YouTube. He has suffered injury from the turtles, but not while simply lifting one carefully.... he was being stupid and went inside a turtle trap full of snapping turtles. He actually has a video addressing exactly this question here: STOP! Save this Turtle? (YouTube). In summary, go behind the turtle and lift it with a hand on the right and left side of the shell where the top and bottom of it join, between the front and back legs a few inches off the ground and get it across the road in the direction it was headed. I would use a shovel. Just pick it up gently and set him/her down on the other side. Not the answer you're looking for? Browse other questions tagged safety animal-behaviour turtles or ask your own question. How to secure wild Red Eared turtle eggs from predators?